The history of the BB - NCIPD Ltd began in 1881 when an Anti-variola Laboratory was established at the District Hospital in the town of Razgrad, after a Royal Memorandum of Prince Battenberg. The laboratory was headed by Dr. Boris Ox. In 1888 an Antivariola Institute was opened in Sofia. It was transformed into a Bacteriological Institute later on. In 1890 the Antivariola Laboratory and the Bacteriological Institute merged. Eight years later the Antiplague Institute joined them. The production of antivariola vaccine and large-scale studies on its effectiveness and side reactions were started. Antiplague vaccine was also prepared. In 1908 the production of anticholera vaccine, polyvalent antistreptococcal serum and type-specific sera for diagnostic purposes began. 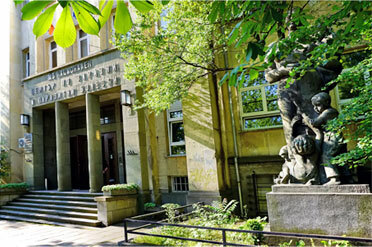 In 1910 the united Bacteriological Antivariola and Antiplague Institutes were given the name Central Institute of Hygiene. In March 1921 the Supreme Medical Council issued new regulations giving a higher status to this institution. Gradually the scope of its activities broadened and it turned into a real center of the prophylactic medicine in Bulgaria. The devoted work of the founders is nowadays greatly admired. Over the years the Insitute has covered a wide area of research and production of preparations for the prophylactic work of the National Health Care. The Rockefeller Foundation took interest in the work performed in the Institute and the visit of its representative Prof. Selektar marked the beginning of an useful long-term cooperation. According to an agreement signed in 1928 the Foundation granted 19.5 millions leva for a new building. Its construction started in 1932 -1933. The official opening of the building with well-equipped laboratories took place on March 3, 1938. The representative of the Foundation at that time R. Collins was appointed Executive Director of the Institute. The Institute was divided into three departments; Microbiology, Chemistry and Hygiene. A farm was attached to the Institute to take care of the necessary animals and produce sera from them (it is located in the suburbs of Sofia, in the foot of the Ljulin mountain). The variety of prophylactic, therapeutic and diagnostic sera gradually increased. Sera against gas gangrene, typhoid fever, paratyphoid fever, anthrax, botulinus, E.coli infections, etc. were included in the list. New methods for diagnosis of infectious diseases were widely introduced. The production of nutrient media was enlarged. During the years of World War II the Institute worked on solving the new problems related to the spread of malaria, tuberculosis, anthrax and syphilis. In 1949 new departments were included in the structure of the Institute. The department for production of biopreparations was established as a separate unit. A department of epidemiology started working and a separate division for organizational and methodological activities was formed. It took care of the connections of the Institute with the local microbiological laboratories and the introduction of new methods for diagnosis in these laboratories. In the late fifties the problem of the viral infections became serious and a Virology Department was set up. As the Medical Academy was created in Bulgaria in 1972, the Institute was incorporated into it. It was named a Research Institute of Infectious and Parasitic Diseases and for about 20 years it was a part of the Academy. In 1991 the National Centre of Infectious and Parasitic Diseases NCIPD became an institution of the Ministry of Health. Almost 10 years later the production of the biopreparations was separated in the state-owned firm BB-NCIPD, Ltd. The bioproducts of the BB-NCIPD Ltd.: BCG, Diphteria and Tetanus vaccines, Allergens, Tuberculin, Immunostimulators - Respivax, Urostim and Dentavax, etc. are exported in more than 90 countries in the world. BB-NCIPD Ltd. produces also a large number of diagnostic preparations. As a result of the research and production activities of NCIPD, respectively BB - NCIPD Ltd., the vaccination programmes could be effectively implemented in the country. The activity of BB-NCIPD Ltd. in the production of biopreparations results in success with the prophylaxis and diagnostics of the infectious and parasitic diseases in the country. The products are well accepted all over the world. The production facilities, the quality of the products and the quality management system meet the high standards of the Bulgarian and European Legislation. Since December 2002 BB-NCIPD Ltd. was approved by Lloyds’s Register Quality Assurance as complying to the standard ISO 9001:2000 and was recertified to the standard 9001:2008 (certificate No. 368990). The compliance of the manufacture of nutrient media and diagnostic antisera was certified to the standard ISO 13485:2003 since 2008. The Bulgarian Drug Agency issued License of Manufacture No. P-I-08-002 15.03.2012 to BB-NCIPD Ltd. certifying the compliance of the production to the Bulgarian Regulation on Good Manufacture Practice that is in agreement with the European Union Rules. On April 2003 BB-NCIPD Ltd. joined in The Bulgarian Generic Pharmaceutical Association. Copyright © 2003-2019 BB - NCIPD Ltd.